Justice Spinner of Suffolk County New York has taken Immigrant Savings Bank to task for refusing to engage in good faith settlement conferences required by a 2008 amendment to the New York Banking Law. Judge Spinner has ordered Immigrant Mortgage Company to pay a Huntington New York couple a $100,000 as compensation for the banks “deplorable” mortgage agreement and its bad faith foreclosure negotiations. In his decision Judge Spinner stated “the court…determines that the imposition of exemplary damages upon (the plaintiff bank) is equitable, necessary, and appropriate in light of plaintiff’s shockingly inequitable, bad faith conduct, as well as to serve as an appropriate deterrent to any future outrageous, improper and wrongful activities”. His decision was in the case of Immigrant Mortgage Company v. Corcione, Q009/28917. In addition Justice Spinner has also “forever barred” Immigrant from collecting interest on the $302,500 mortgage as well as any legal fees, cost “or any sums other then the principal balance”. In their lawsuit defendants Jane Corcione and Anthony Corcione claimed that Immigrant refused to engage in good faith settlement conferences, as explicitly required by the 2008 amendment to the banking law. The judge singled out in his decision a half a dozen of the mortgage agreements “deplorable” and “distressing” provisions. One of the provisions singled out by Judge Spinner was a clause which forever prohibited the Corcione’s from seeking protection under the United States Bankruptcy Code. In his decision Judge Spinner stated that if this clause was enforceable against the Corcione’s it would be able to preempt federal insolvency statutes. Judge Spinner’s decision stated that a pre-bankruptcy waiver should under no circumstances be enforced against consumer debtors. His decision found the waiver was unconscionable, unreasonable, over reaching and absolutely void as against public policy. This decision by Justice Spinner is the third time he has sanctioned a mortgage lender for its conduct in a foreclosure proceeding. Justice Spinner is the presiding judge in Suffolk County Residential Mortgage Foreclosure Conference Part. Suffolk County has the most foreclosure cases pending in the State of New York. Should you find yourself facing a foreclosure on your home contact the foreclosure defense attorneys at the Law Office of Elliot Schlissel. 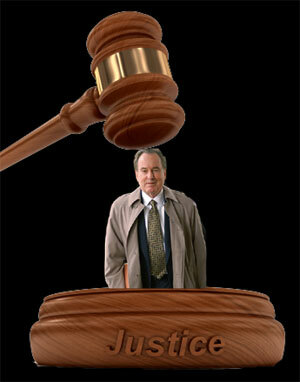 We have more than 30 years experience in defending lawsuits by creditors. Call us at 1-800-344-6431 or send us an email. The federal government has bailed Wall Street firms out to the tune of $700,000,000.00. This is a form of corporate welfare. The restructuring was done to prevent large Wall Street firms from going bankrupt. Instead of amending the Bankruptcy Law to help these Wall Street firms, the government simply gave them $700,000,000.00 in loans. Recently, Jamie Dimon of JP Morgan Chase and Lloyd Blankfein received millions of dollars in salary packages. The government bails out Wall Street and the Wall Street tycoons get richer and richer. During this period of time, between 7.1 million and 7.9 million households according to mortgage bond trader, Amherst Securities, fell behind in their mortgage payments and are subject to losing their home. It is estimated that as many as 25% of all the homes in the United States have mortgages on them that are greater than the value of their home. The term used to describe this situation is calling the home “under water”. President Obama had initially asked that when individuals do mortgage modifications with their banks that the banks restructure their mortgage so they only have to pay an amount equal to the value of their home. The banks have refused to do this. The mortgage modifications by banks in the United States modify the payments but do not reduce the amount that is owed. The United States Constitution reserves all rights to make laws concerning bankruptcies to the federal government. Congress passes all laws that deal with bankruptcy. Congress needs to strengthen the bankruptcy court’s ability to restructure mortgage loans when individuals file bankruptcy. Congress has already bailed out Wall Street. Now they need to bail out the American homeowner. Unfortunately, the large financial institutions in this country oppose any modifications to the Bankruptcy Law to help out homeowners. 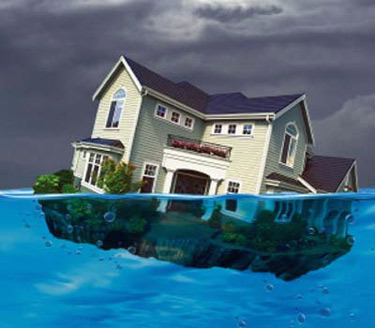 Congress needs to help the American homeowner and modify the Bankruptcy Laws to deal with the issue of restructuring mortgages that are under water. Congress has already bailed out the financial industry to the tune of $700,000,000.00, now they need to bail out the American homeowner! Should you have questions concerning bankruptcy or mortgage modifications, feel free to contact the Law Office of Elliot S. Schlissel to discuss these matters at 1-800-344-6431 or email us at schlissel.law@att.net. Picture courtesy of grassland properties. 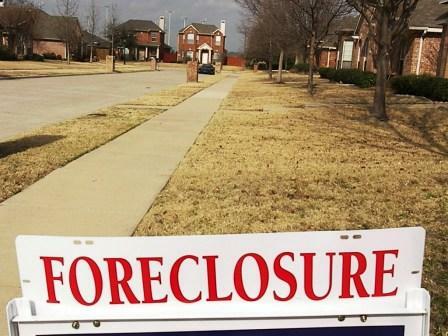 Projections have been made that there will be as many as 3,000,000 foreclosures in the United States in 2010. This will surpass the foreclosure rate for 2009. The United States Treasury Department has been in negotiations with many of the country’s largest financial institutions regarding their participation in a new second mortgage program designed to modify foreclosures. Unfortunately, negotiations have not been successful up to this point. New loan modification programs are necessary to help individuals going into foreclosure this year. Foreclosures have a negative effect on the value of real estate in local communities. In 2009, mortgage modifications set a record. 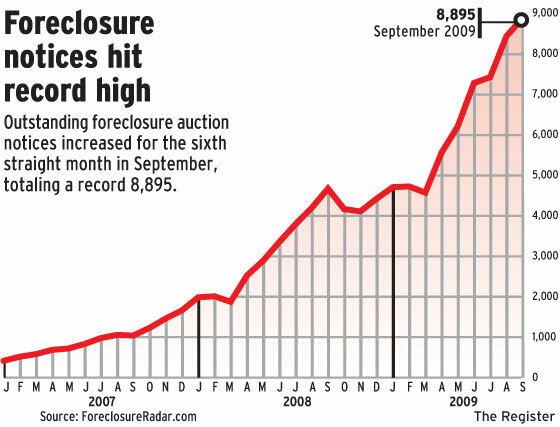 However, foreclosure still were at an all time high in 2009. Hopefully, the new mortgage modification programs being proposed to the Treasury Department will stem the tide of new foreclosures. If you need help with loan modification, foreclosure, or bankruptcy help, you can always e-mail us or call us anytime at 800-344-6431. Justice Jeffrey A. Spinner, sitting in a Supreme Court Part in Riverhead, New York (Suffolk County), has recently ordered that a $292,500 mortgage be deemed “cancelled, voided, avoided, nullified and set aside”. He took this action due to the fact that IndyMac Mortgage Services, a division of One West Bank FSB and its representor were engaged in “harsh, repucnic, shocking and repulsive” behavior. Greg Horoski and his wife, Diana Wano-Horoski, bought a four bedroom, three bath home 1994. They paid $178,000 for their home. They refinanced their home in 2004 for $292,500. They eventually fell behind on their mortgage. Mrs. Horoski was in failing health. She had undergone triple bi-pass heart surgery in 2006. Every two or three months Mr. Horoski would contact his bank for the purpose of avoiding foreclosure. He would advise them that he could make payments in various amounts. He asked if they would accept these payments as a good faith measure and that they reinstate the loan. Greg and Diana Horoski appeared at every court appearance. Court conference were rescheduled on five separate occasions due to IndyMac Bank’s failure to cooperate. Judge Spinner’s decision indicated that IndyMac Bank displayed an intransiness in its continuing failure and refusal to cooperate with the court. The Judge said a bank officer who appeared on September 22nd had a “Opprobrious demeanor and condescending attitude” . He would not accept any offer by the homeowners including an offer by their daughter to purchase the house. The Judge further indicated on November 18, 2009 court conference the bank did not even know the specific balance due in owing of the house. The Judge felt due to the extremely inappropriate behavior of the bank, severe sanctions would have to be imposed to prevent the bank from engaging in further abuse. In the end, IndyMac Bank would not consider any loan modification arrangements. The bank has indicated they will appeal Judge Spinner’s decision. Are you behind in your mortgage? 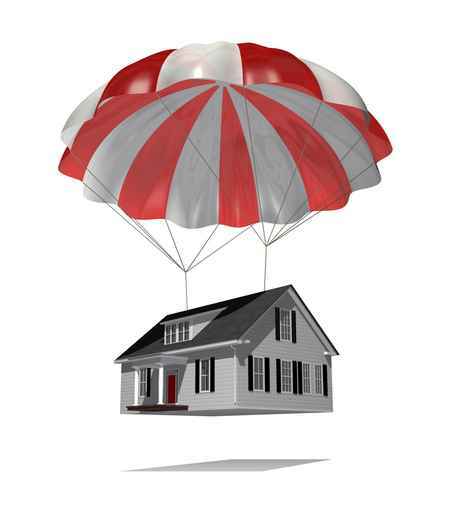 Are you in foreclosure? Problems with your bank or mortgage company? The mortgage renegotiation and defense lawyers at the law office of Elliot Schlissel may be able to help you with these problems. Contact us by e-mail or call anytime at 1-800 344-6431.